It’s Interop week, which means a lot of new product announcements coming out on all kinds of interesting hardware and software. HP is no different and a couple of the products that they’ve got on tap appear to have some interesting designs on how we perceive the idea of a campus network for the coming months. HP has announced a new network design methodology they refer to as the Flex Network Architecture. It addresses many of the deficiencies that HP is seeing in network design related to thinking about networks in old ways. There has been a lot of innovation in networking in recent months but it has been focused primarily on the datacenter. This isn’t all that surprising, as most of the traction around building large networks has included buzzwords like “cloud” or “fabric” and tend to focus on centralizing the exchange of data. HP wants to take a great number of these datacenter innovations and push them out to the campus and branch network, where most of us users live. 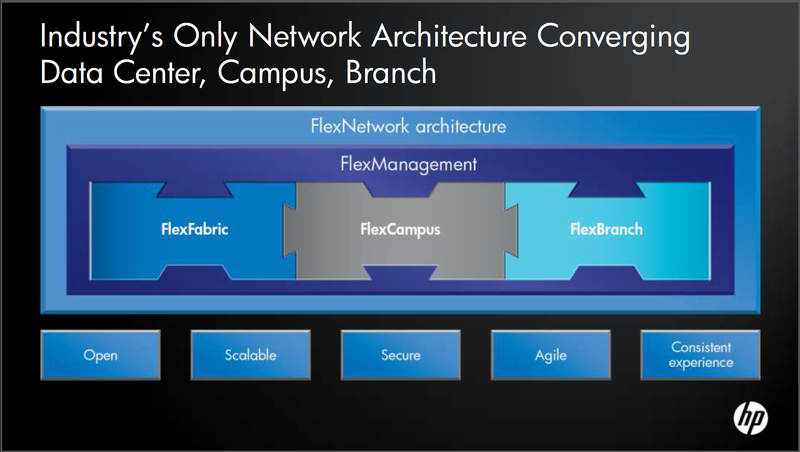 HP’s three primary areas of focus in the Flex Network are the Flex Fabric, which is the datacenter area that includes unified computing resources and storage, Flex Campus, which is the primary user-facing network area where users connect via technologies such as wireless, and the Flex Branch, where HP is focusing on creating a user experience very similar to that of the Campus users. To do this, HP is virtually eliminating the lines between what have been historically referred to as “SMB” or “Enterprise” type networks. I believe this distinction is fairly unnecessary in today’s market, as many branch networks could technically qualify as “Enterprise”, and a lot of campus networks could realistically be considered “SMB”. By marrying the technology more toward the needs of the site and less to a label, HP can better meet the needs of the environment. 1. Standards – In order to build a fully resilient architecture, standards are important. By keeping the majority of your network interoperable with key standards, it allows you to innovate in pockets to improve things like wireless performance without causing major disruptions in other critical areas. 3. Security – Security should be enabled all over your network. It should not be an afterthought, it should be planned in at the very beginning and at every step of the project. This should be the mantra of every security professional and company out there. 4. Agility – The problem with growing your network is that you lose the ability to be agile. Network layers quickly overwhelm your ability to quickly make changes and decrease network latency. HP wants to be sure that Flex allows you to collapse networks down to at most one or two layers to provide the ability to have them running in top condition. 5. Consistency – If you can’t repeat your success every time, you won’t have success. By leveraging HP’s award winning managment tools like IMC, you can monitor and verify that your network experience is the same for all users. The focus of the Flex Campus for this briefing is the new A10500-series switch. This is a new A-series unit designed to go into the core of the campus network and provide high-speed switching for data bound for users. This would most closely identify with a Cisco Catalyst 6500 switch. The A10500 is the first switch in HP’s stable to provide IRF in up to 4 chassis. For those not familiar, Intelligent Resilient Framework (IRF) is the HP method of providing Multiple Link Aggregation (MLAG) between core switches. By linking multiple chassis together, one logical unit can be presented to the distribution layer to provide fault tolerance and load balancing. HP’s current A-series switches currently support only 2 chassis in an IRF instance, but the 4IRF technology is planned to be ported to them in the near future. One of the important areas where HP has done research on the campus core is the area of multimedia. With the world becoming more video focused and consuming more and more bandwidth dedicated to things like HD Youtube videos and rich user-focused communications, bandwidth is being consumed like alcohol and a trade show. HP has increased the performance of the A10500 above the Cat 6500 w/ Sup720 modules by reducing latency by 75%, while increasing switching capacity by almost 250%. There is also a focus on aggregating as many connections as possible. The launch LPUs (or line cards in Cisco parlance) are a 16-port 10GbE module and a 48-port 1GbE module, with plans to include a 4-port 40GbE and 48-port 10GbE module at some point next year, which should provide 270% more 10GbE density that the venerable Cat 6500. The A10500 comes in 3 flavors, a 4-slot chassis that uses a single crossbar fabric to provide better than 320 Gbps of throughput, and an 8-slot chassis that can mount the LPUs either vertically or horizontally and provide no less than 640 Gbps of throughput. These throughput numbers are courtesy of the new MPU modules, what Cisco people might call Supervisor engines. The n+1 fabric modules that tie all the parts and pieces together are called SFMs. This switch isn’t really designed to go into a datacenter, so there is no current plan to provide FCoE LPUs, but there is strong consideration to support TRILL and SPB in the future to ease the ability to interoperate with datacenter devices. Another new product that HP is launching is focused on security in the datacenter. This comes courtesy of the new TippingPoint S6100N. This is designed to function similarly to an IDS/IPS box, inspecting traffic flying in and out of your datacenter swtiches. It has the ability to pump up to 16 Gbps of data through the box at once, but once you start inspecting more and more of that traffic, you’ll probably see something closer to 8-10Gbps of throughput. The S6100N also gives you the ability to have full visibility for VM-to-VM conversations, something that is currently giving many networking and security professionals grief, as much of the traffic being generated in today’s datacenter is generated and destined for virtual machines. I think there is going to be a real opportunity in the coming months for a device that can provide this kind of visibility without impeding traffic. HP looks to have a great future with this kind of device. The third new piece of the Flex Network Architecture is the addition of Intelligent Management Center (IMC) 5.0 to the Flex Management portion of the Flex Architecture. The flagship software program for HP’s network management strategy, IMC provide Single Pane of Glass (SPoG) functionality to manage both wired and wireless networks, as well as access control and identity management for both. It integrates with HP Network Management Center to allow total visibility into your network infrastructure, whether it consist of HP, Procurve, Cisco, 3Com, or Juniper. There are over 2600 supported devices in IMC that can be monitored and controlled. In addition, you can use the integrated access controls to control the software being run on the end user workstations and monitor their bandwidth utilization to determine if you’ve got a disproportionately low number of users monopolizing your bandwidth. IMC is available for installation on a dedicated hardware appliance or in a virtual machine for those that have an invested VMware infrastructure. You can try it out all the features for 60 days at no charge to see if it fits into your environment and helps alleviate “swivel chair” management. The new HP Flex Architecture gives HP a great hook to provide many new services under a consistent umbrella. The new addition of the A10500 gives HP a direct competitor to the venerable Cat 6500 platform that can provide high speed connectivity to the campus core without muddying the waters with unnecessary connectivity options, ala the A12500 or Nexus 7000 with their high-priced FCoE capabilities. The S6100N helps HP begin to focus on the new landscape of datacenter security, where firewalls are less important the visibility into traffic flows between physical and virtual servers. The IMC update allows all of these pieces to be managed easily from one operations center with no additional effort. It seems that HP is gearing up to spread out from their recent success in the datacenter and take the fight to the campus and branch office. I liked what I heard from HP on this call, as it was more of what HP could do and less of what Cisco couldn’t. So long as HP can continue to bring new and innovative products to the networking marketplace, I think their fortunes have nowhere to go but up. This entry was posted in HP, Switching by networkingnerd. Bookmark the permalink. The S6100N provides “full visibility for VM-to-VM conversations”. Now that’s a real trick. I wonder how they’ll pull it off. And how come that feature isn’t mentioned in the product’s own data sheets?